Robert Dobkin, Director. Nick Schenk and Bill Dubuque, writers. A wonderful drama that delivers. Excellent! The Columbia Review. Hank Palmer (Robert Downey Jr.) is a hard-charging, take-no-prisoners, win-at-all-cost lawyer. And, yes, all the aforementioned clichés do apply, but somehow the line isn’t crossed into cheesy. Nor is it crossed when he must—after years of estrangement—return to his all-American mid-western hometown for his mother’s funeral and confront a disapproving father, a festering family wound, and his high-school sweetheart (a single mom whose daughter may, or may not, be his daughter). To top off this kitchen sink overflowing with chewed-up plotlines, Hank suddenly has to use his courtroom skills to defend his father, Judge Palmer (Robert Duvall), who is accused of a deadly hit-and-run. The prosecutor (Billy Bob Thornton) is determined to get a conviction because—yes, you guessed—he hates Hank, who had beaten him and gotten a guilty client off the hook years ago. Now, in hands less capable than Director David Dobkin, who assembled a highly skilled cast to work with, The Judge would have been a dud. But instead, this movie works the magic. Robert Downey Jr. is totally convincing across a challenging spectrum of emotions. 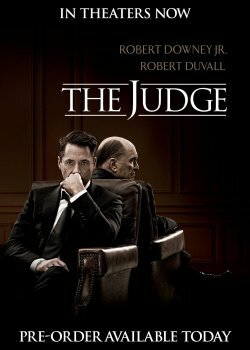 Robert Duvall is incredible as a tough judge, a disciplinarian father (struggling with regrets), and a grieving husband who is facing his own death with great dignity. And Billy Bob Thornton does his disappearing trick where you forget it’s Billy Bob and take him at his role. Also delivering top-notch performance are Vincent D’Onofrio as Hank’s older brother, Glen, Jeremy Strong as the younger (and mentally disabled) brother, Dale, and Vera Farmiga as the ditched high school girlfriend who went on to make something of herself without losing that small-town sweetness. If I had to bet on Oscars, I’d put my money on Jeremy Strong (who strikes a perfect balance in portraying a mentally disable grown man) and Robert Duvall who, interestingly enough, got his first major role as a mentally disabled “Boo Radley” in To Kill a Mockingbird (1962). The screenplay, by Nick Schenk Bill Dubuque, also deserves high praise for building up the emotional pace of the movie to a most-satisfying conclusion and for connecting all the threads of story and human subplots quite beautifully. The Judge is a wonderful drama that delivers suspense, conflict and familial emotions and hurts that would feel painfully familiar to many of us. Excellent!